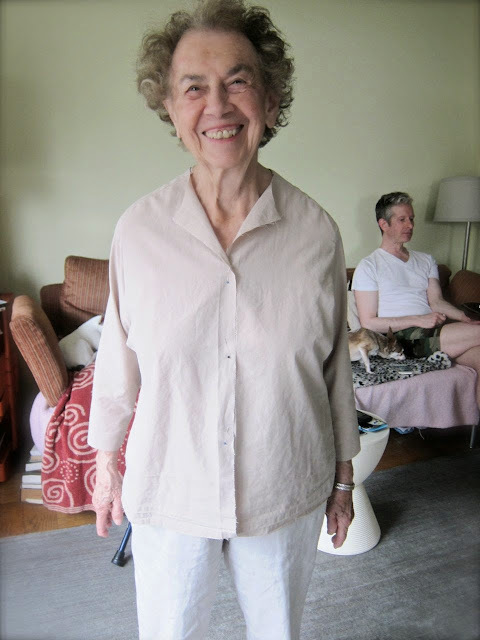 Yesterday a few of you suggested that I work from a smaller pattern to create a well-fitting blouse for my mother. 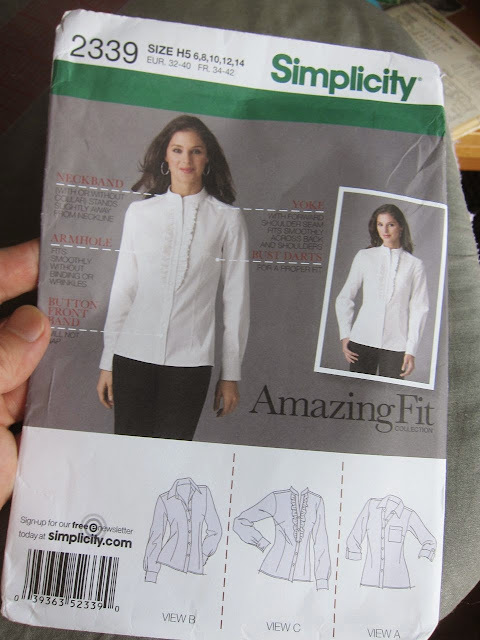 I had purchased Simplicity 2339 a few years ago and decided to give it a try rather than continuing to tweak my vintage Butterick pattern. Straight out of the gate I added a 1" sloping shoulder adjustment in both front and back. I also took 1/2" off the bottom (outer) edges of the yoke, so that the bottom turns up (like a smile). while the back slopes down. I skipped the collar this time (this pattern calls for a two-piece collar and a button placket instead of a one-piece collar and facings). The results are a big improvement on yesterday's muslin. 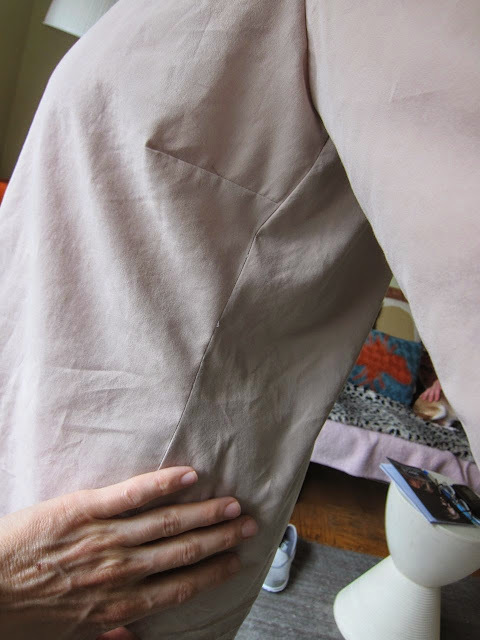 Without any other alteration, the shoulder seam sits much more forward than yesterday's did. The right sleeve went on kind of wonky so I removed it. 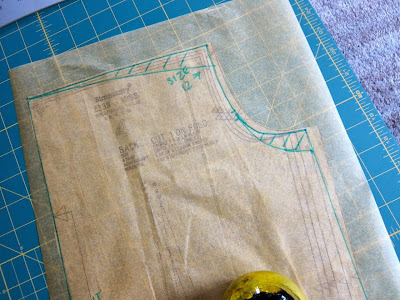 I decided to draft a new sleeve following this Katheleen Fasanella blog post about sleeve cap ease. Basically, the sleeve is fuller in the back (where you need more room for movement) than in front. So that's how things stand as of today. My mother says she doesn't want her blouse any more fitted than this. I think it looks pretty good. I'm not sure which sleeve to use; it's hard to tell which shape looks better. As always, your feedback is welcome, and if these are the kind of adjustments you're used to making, I'd especially love the input. Wow-that's a nice improvement in the fit. I think I would add a little more to the back yoke - it looks like it is still pulling a bit, and maybe it should be sitting a little higher. Looking forward to seeing the final! 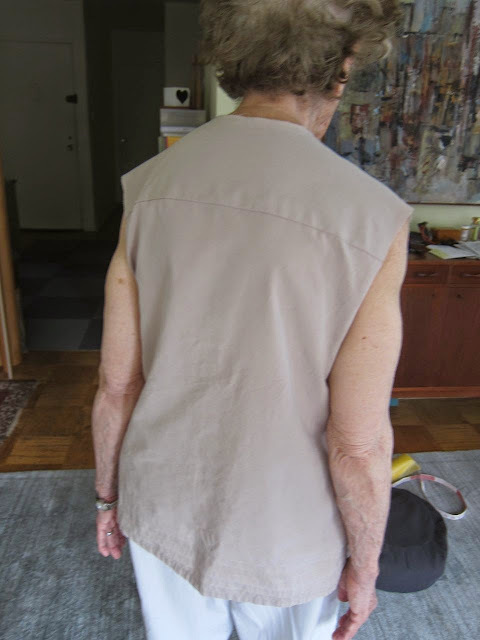 If you lift shoulder at armhole to nothing at neck you will get rid of side fullness,also your mother will be able to move her arm more if the sleeve head has less height like a shirt sleeve head. I'm not sure I understand the first part, about the side fullness, Brendan. 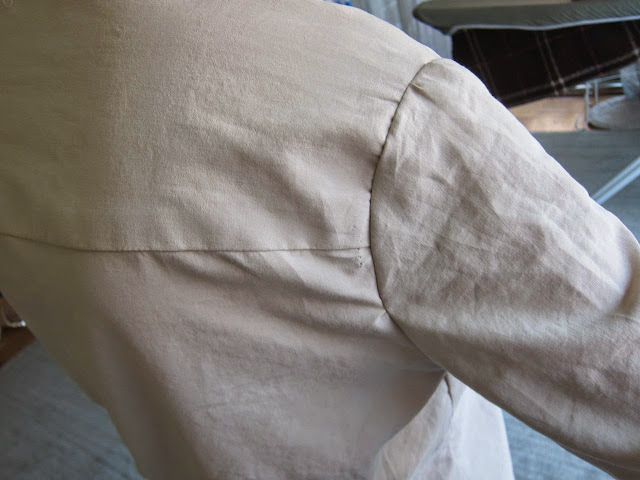 If you were to lift the shoulder ,that is lift the shoulder at armhole and pin it you will find you you have a side seam that hangs very straight and smooth, its a casual garment so you may be happy to leave it as it is. It has only been in the past three posts, but I swear Freddie is photo-bombing your mom. The new draft looks really good. For a final check, I usually cross my arms across my chest to see if anything pulls or feels uncomfortable as sometimes what looks right on me isn't. Can't wait to see this done up in that floral fabric you bought. I think this looks really good but I would recommend putting at least the collar stand on before making any final decisions. The cut neckline you have now can easily move around and stretch out. Whatever neckline finish you will make for the real blouse will not. I suspect from the pictures that the neckline is dragging back a bit which could be uncomfortable and/or look odd with a collar. 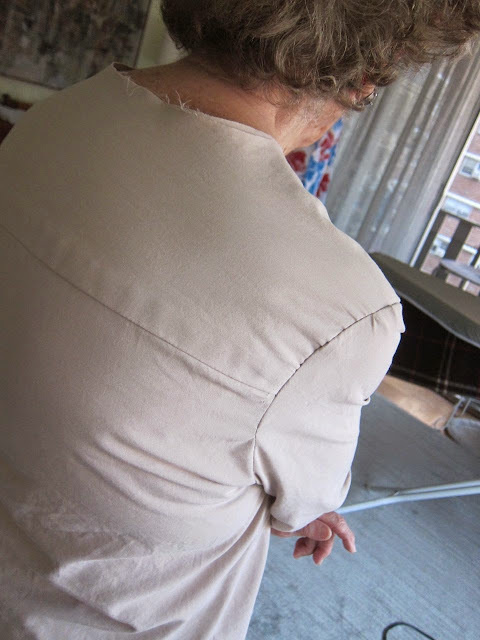 It would be a normal fitting issue with a rounded back, so you would expect to find it when sewing for an older lady. I've made a couple of tops (only in jersey though) for my grandmother, who is in her mid-eighties so I've had a bit of experience with this. Thanks, Lauriana -- I definitely think I need to add to the back neckline so that it sits higher. Peter, I don't often comment on fitting issues because I'm no expert, but I'm also dealing with the same rounded back or "dowager's hump" (how dreadful is THAT term) in my own clothes. I can thank my gene pool for that. On my last jacket I had to rotate the apex of the sleeve forward, which is what you've accomplished. Otherwise, the sleeve popped off the back of my shoulder. 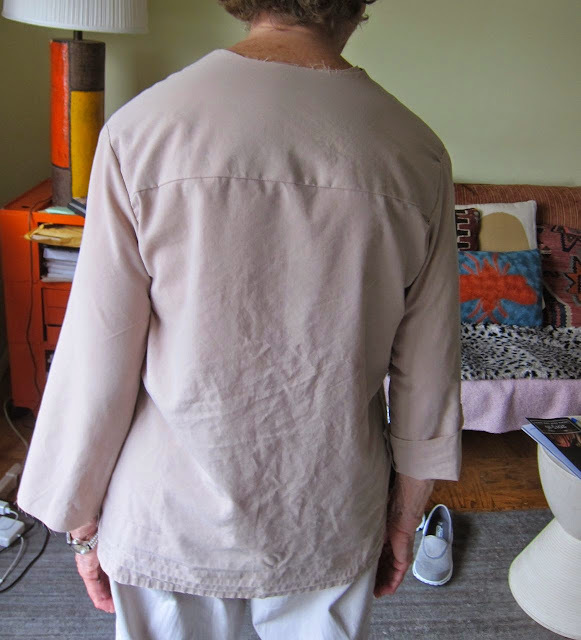 What I didn't do, and should have, is add fabric to the back neck edge. I think you may have to do this here. Otherwise the collar will sit too far back, and your mom will be constantly wanting to tug it forward to make it sit at the back of her neck. Of course, I'm no expert so take all of this with a grain of salt! 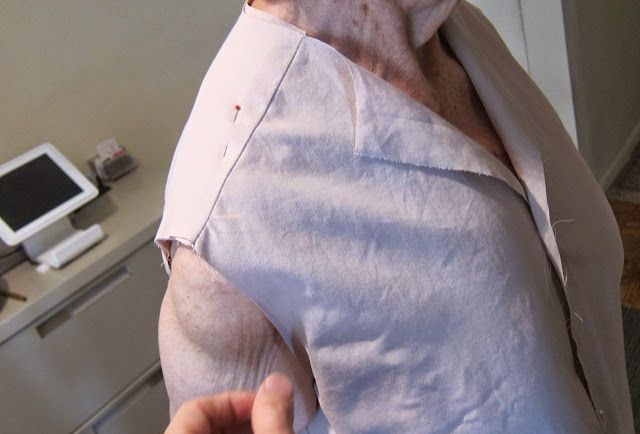 The one time I made a yoked shirt, I took fabric(pattern tissue) out of the yoke itself, instead of the front and back bodice pieces. That eliminated the effect of the shoulder seam sitting more forward in the muslin version. I have avoided yokes ever since,,,, too much bother unless it starts out as a deep yoke. 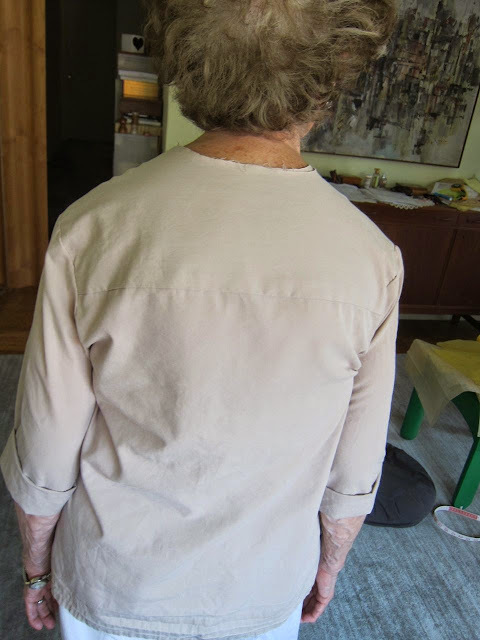 A "dowagers hump" (I hate that term, too) adjustment to the back yoke would help with the fit, and bring the collar/neckline up higher toward her neck. But if your mom is happy, then let it go. This is a huge improvement on the first muslin. The body of the blouse is much more flattering now. I agree with the earlier posts that the collar should be sitting up higher. Also, is the armhole restricting her movement? Looks like it could be from the photo. Looking good! For my "dowager's hump" beginning I cut the back shoulder and neck a size larger and cut the front shoulder and neck a size smaller. 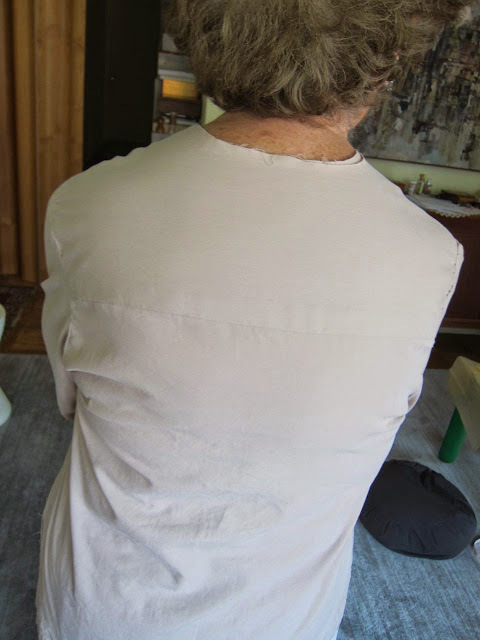 Or you can make a cut horizontally at the upper back and lift the whole mid back without adding to the shoulder height. Can't wait to se it in the fabric. I agree with lw, the body of the blouse is much more flattering now. Despite the issues you are concerned with, I'm impressed with the fitment and shape. Front of the top looks so much better on this version! 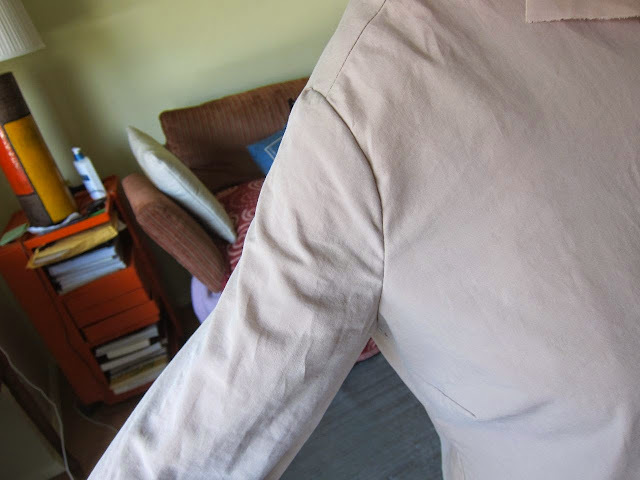 I see another issue with the domestic pattern companies-underarm sleeve seams that tend to be too low where they join the body. That might be a future project fix. Michael, I learn a lot reading your blog. 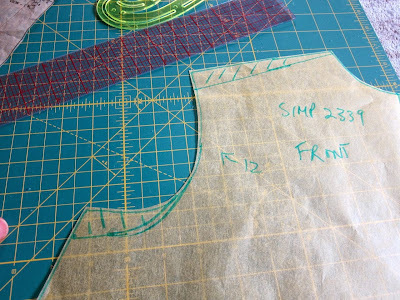 I see what you did on the pattern piece to adjust the slope of the shoulders. It looks like you also adjusted the underarm of the armhole. Did you adjust it be the same amount as you did the shoulder slope? If so, why? My name is Peter. 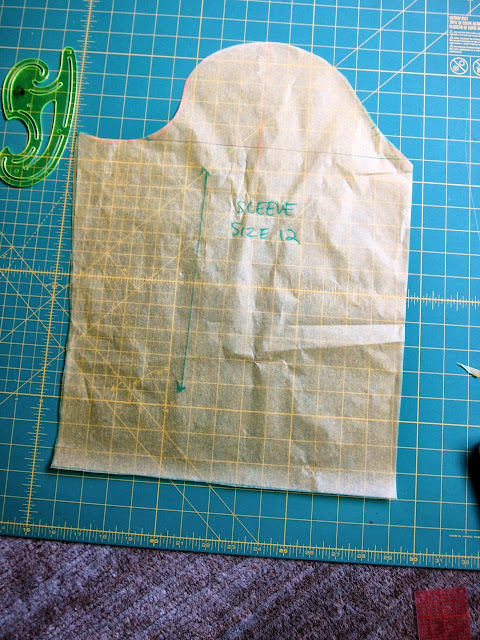 You're in effect raising the shoulder so you must lower the armhole the same amount.